Dogs love grass. They love to roll on it, play in it but when they eat it, many of us think this is a something they shouldn't be doing - that there's something wrong with their digestion. This isn't necessarily the case. Barley grass, in particular, contains the enzymes, the chloryphyll, the vitamins that dogs need to digest and absorb food nutrients. These are things that processed pet foods may be lacking. Studies have shown that processed foods can have a negative affect on pets and supplementing their diet with barley grass can improve their coat, increase energy levels and playfulness and even eliminate bad breath. Read more about the benefits of barley grass here. While there is much talk about barley grass supplements, we say, why not feed it to your pet fresh? 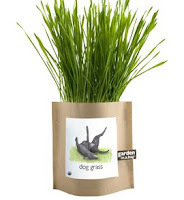 Our Barley Grass Garden in a Bag for dogs contains everything you need to grow organic barley grass - even the leakproof bag. After 5-10 days your seeds will sprout and just weeks later you'll be able to cut the grass and feed it to your dog or sprinkle it on its food. An ideal organic treat to help your dog's health and vitality. Visit our Vancouver-based online eco boutique Lavish & Lime for the Organic Barley Grass Garden in a Bag and to browse our full selection of herb and flower gardens in a bag. If you have any thoughts or ideas about barley grass or dog health in general, please leave a comment below. We'd love to hear from you! How long should you wait in between cuttings. how long does the plant usually last with continuous cutting? Would growing in a larger pot enable the grass to spread (getting more), perhaps being able to cut in sections rather than a full mowing each time?